Our inspirational July issue hits the shops on Friday! The July issue of Craft Stamper magazine hits the shops this Friday (3rd June), our wonderful subscribers will be receiving their copies very soon, if not already! This month, we have the fabulous seahorse image on the cover available to you in both digital AND polymer format, alongside an extra three digital images to complete your under the sea themed projects. Our designer, Elizabeth Robinson, has done an amazing job! We have LOADS of stamping tutorials in this issue! Sarah Anderson shares a beautiful stamping and embossing project on page 18; the finished result looks just like Japanese Washi paper, simply gorgeous! Kim Dellow has created the cutest clay pot, perfect for a teeny plant! She shows us how to stamp into the clay before shaping it, with the end result being a wonderfully textured home decor item! Have a look on page 29. Another home decor idea is the watercolour technique shared by Georgie Connelly. The effect of the black stamping through a stencil is stunning, and is such a great look! Check it out on page 6. We also have a quirky canvas project from Kassa Hayselden..
and an amazing Masterclass from Joanne Allison featuring hot glue techniques in this issue! We are so pleased to announce the winners of our May Challenge: Take A Stamp:Anything Goes! Cornelia will win a Guest Designer slot here on the blog, her very own Winners Profile, and of course her amazing art will be featured in it's own 2 page spread in Craft Stamper magazine! Congrats Cornelia! 3 stamp sets, and three stencils! Congrats Sandma, we hope you have fun playing with your goodies! Our June challenge will be launched next Friday, the 3rd! Jan won the challenge with this amazing tag! We loved the immaculate stamping, the wonderfully shaded colouring of the flowers contrasts so well with the textured appearance of the background! A: I have been a stamper for many years. I started stamping after I found a small selection being sold at a craft fair back in 1987. I bought 3, wasn’t sure what I was going to do with them but I was soon hooked. I still have them to this day. As I can’t draw for toffee, stamps now feed my love to colour. A: My very favourite kind of stamps are floral, although I do like quirky too. PaperArtsy JOFY stamps really appeal, but having said that I can’t resist the odd ‘cute’ one. A: Well I seem to have two styles, clean and simple for cards and distress/inky for Tags but in a CAS kind of way! A: I have always enjoyed making cards, but I love creating tags as to me they are little works of art. A: I had to really think about this but the one product I couldn’t be without is very good quality cardstock. 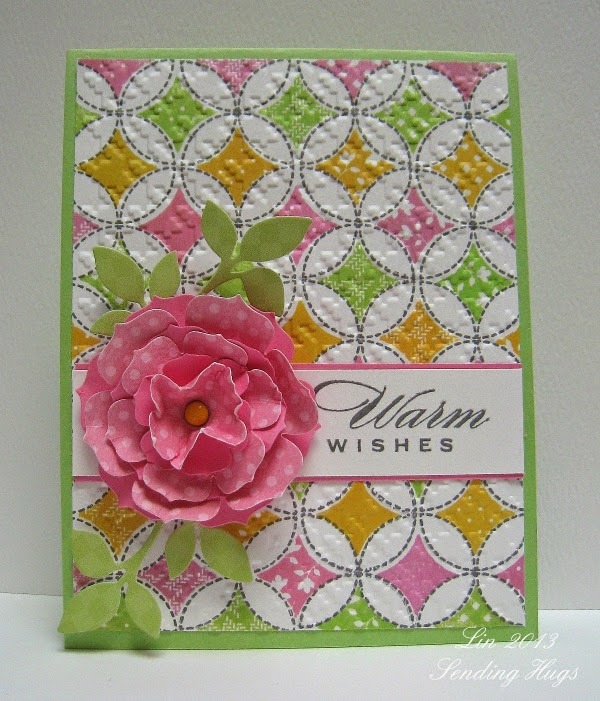 Be it stamping card or coloured cardstock, because without it there would be no creating! Congratulations on being our April Design Winner Jan , and it was lovely to learn a little more about you! Our current challenge 'Take A Stamp: Anything Goes is open until the 25th of May, so still time to enter! Don't forget the fabulous prize of the Designs By Georgina stencils and stamps! See you back here next Friday, where we will be announcing the winner of the May challenge... Good Luck! 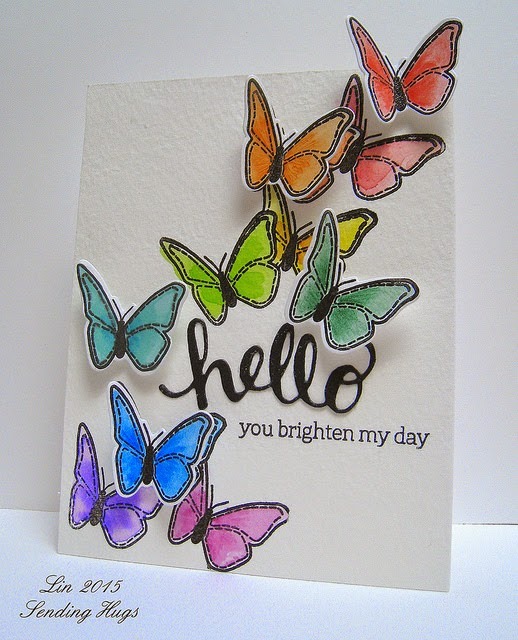 Designs by Georgina is run by Craft Stamper design team member Georgina Ford, and as you might expect, is full of amazing stamps, stencils and chipboard! So many wonderful designs, well worth a look!